SHE'S no stranger to trauma, but even for Ceinie Grudnoff, pulling her elderly neighbour from his burning home moments before fire swallowed it was pretty daunting. Not that you'd know it from talking to her. 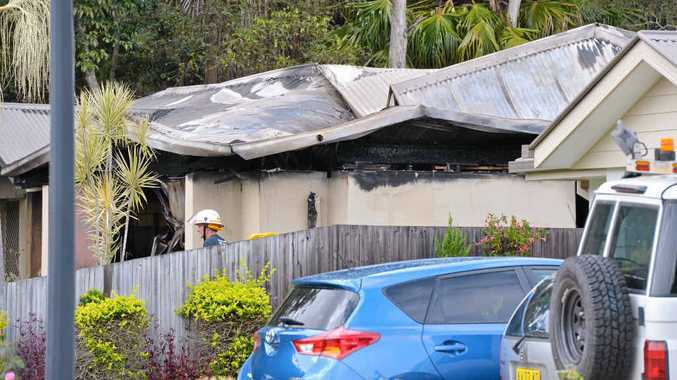 The critical care nurse will be recognised by the Queensland Fire and Emergency Service today for her role in saving 85-year-old John Hunt when his Buderim home was engulfed in flames in the early hours of April 4. Mrs Grudnoff spoke to the Daily yesterday about the drama on the eve of receiving the Assistant Commissioner's Commendation Award. "The more I think about it the more I think how lucky I am to get out of the house that basically exploded behind us," she said. Mrs Grudnoff, 49, said she was woken just before 1am to the sound of her good friend's smoke alarm and panic button sounding. Springing into action, Mrs Grudnoff's husband, Peter, woke their children to get them to safety while Mrs Grudnoff charged next door, where she could see fire well and truly underway in Mr Hunt's garage. She and another neighbour, Sharon Kohncke, kicked down Mr Hunt's front door after their efforts to rouse him failed. "The garage to the right was completely engulfed," she said. "When the door opened we were pushed backwards by the force of the fumes. "I just remember taking a big breath and running through thick fumes and I found him standing at his bedroom door." With mobility an issue for Mr Hunt, and nearby exits locked, Mrs Grudnoff had no option but to take Mr Hunt back the way they had come, through a blanket of thick smoke. 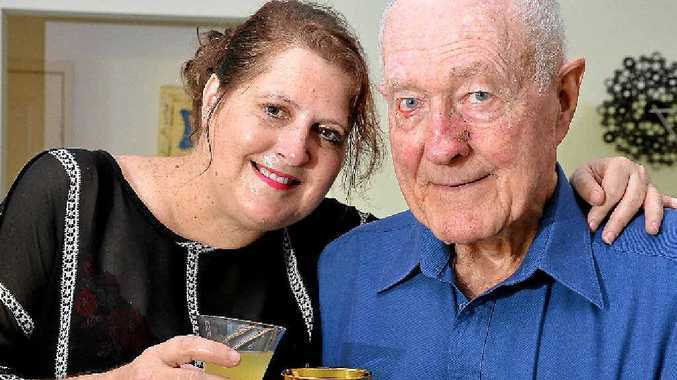 "I basically had to tell him, 'trust me and keep moving'," Mrs Grudnoff recalled. 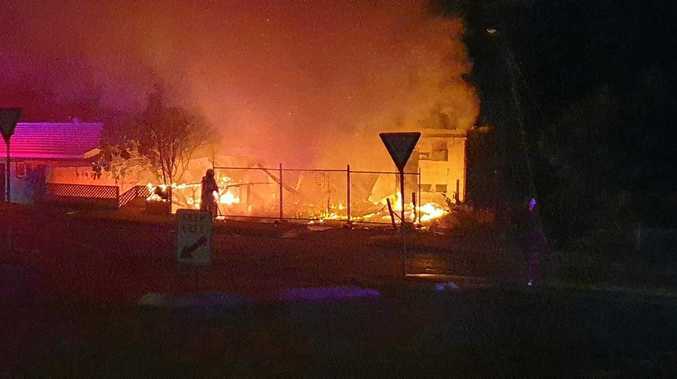 "About three to four metres from the entry I could hear people saying nobody can go into the house and I thought 'geez, we're in here', and I said to him 'if we don't get out now the house is going to explode'. "Conditions had changed totally from when I went in. There were flames coming out of the eaves of the doorway." She recalled reaching the front corner of the garden and hearing a rushing sound as flames shot through the house. 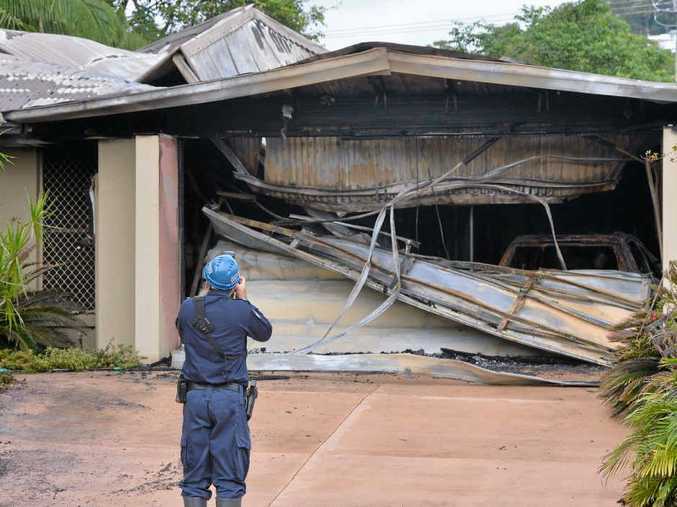 Queensland Fire and Emergency Service fire investigator Greg Scarlett said the intensity of the fire was extreme. He believed no one would have survived had they been inside when the flames exploded through the home. "She's done really well, especially someone that's not trained to deal with that environment," Mr Scarlett said. "It would've been extremely scary. She got out just in time because she wouldn't have survived when the fire 'flashed'." Mr Hunt said he had expressed his gratitude to his close friend countless times since the incident, and was thankful for the care shown to him by his nearby community. "There are several people in the street who have been wonderful," Mr Hunt said. Mrs Grudnoff also praised other residents who played a part in helping save a life that night. As for the humble nurse, she said the thought of being caught in the inferno had never crossed her mind. The magnitude of what she had done did not hit her until she was walking through the wreckage of the home some time later, Mrs Grudnoff said. "I just thought 'oh my god', had we been longer, had I not chosen to run through the door, John would've died," she said. "I could've left my children motherless."